Do you ever feel like you just don’t know what to do next? When you’re faced with problem after problem does it ever feel so overwhelming that you become stuck or just give up? This experience is not uncommon when we are depressed, and particularly when we are a new dad presented with so many new challenges for the first time, even the smallest thing can seem like a big problem. This article shows you how problem solving skills can be learned, quickly enabling you to reduce those feelings of overwhelm or hopelessness. As with all things on this site (and with CBT in general) we pick up skills by doing, so once you have read through this page, follow the step by step instructions to see how problem solving can help you with your current stressors. Behavioural theories of depression suggest that low mood serves as an emotional signal for us to retreat from an unrewarding or punishing environment so that we can conserve energy until our environment improves. Low mood is not a “bad” emotion as such, in that it actually evolved to serve us when times are difficult. However, whilst retreat and avoidance would have been an effective self-preservation strategy for our pre-historic ancestors when faced with famine, loss or danger, in modern times this strategy can contribute to the maintenance of depression symptoms in that we fail to develop the techniques necessary to resolve the problems that we are faced with. If problems remain unresolved then this can lead to them becoming more unmanageable than they were in the first place, and strategies other than Avoidance and Retreat fail to develop, thus leading to further low mood and the cycle of depression ensues. This cycle can be interrupted by changing how we respond to challenges by developing Problem Solving skills. 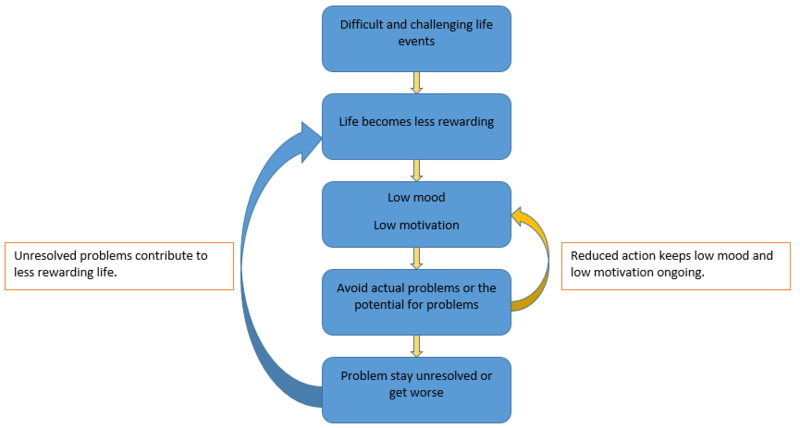 The diagram below shows how depression can be kept going through avoidance and reduced activity. Problem solving has been established in therapy as a way of dealing with psychological distress since the early seventies and is both an integrated element of treatment models and a treatment in its own right. As a treatment for depression, Problem solving therapy has been shown to be an effective treatment when compared to other therapies and better that waiting list or no treatment at all. There are two main aspects to problem solving – Problem Orientation and Practical Problem Solving. This article is going to teach you the skills of practical problem solving. Four letters for you to remember. Problem – The first step in effective problem solving is to clearly define what the problem is. It is not unusual when placed under some degree of pressure for us to exaggerate or distort a particular presenting issue, or to attempt to solve ten problems simultaneously rather than just one, much more manageable one. By defining the problem into one or two clear, explicit statements we are able to maintain focus upon one problem area at a time, thus increasing our chances of finding a useable solution. 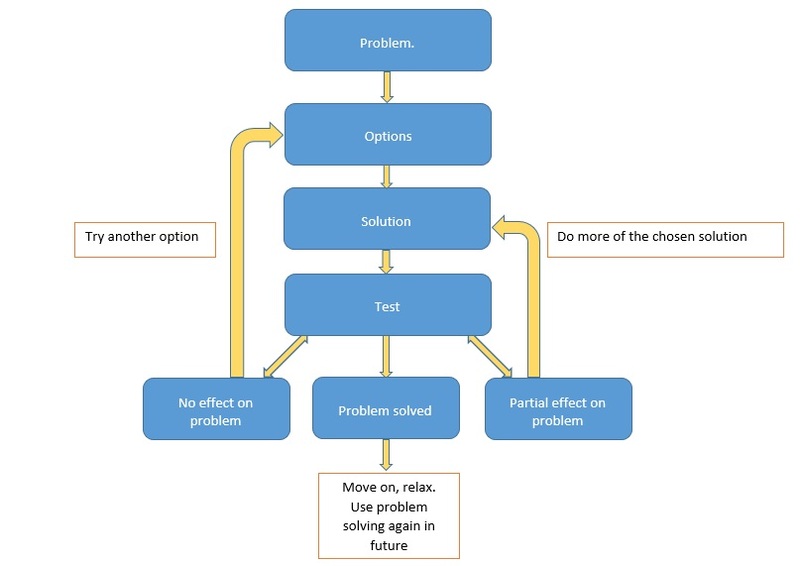 Options – Step two is to generate as many potential options or solutions as we can which may remedy our problem. It’s important at this stage to abandon any criticism and judgement as we generate as many potential actions as we can. No idea should be rejected on the grounds of being too silly, too extreme or because we just don’t think that it will work. When we are depressed, our thinking becomes much more rigid and habitual and thus less creative and imaginative. By brainstorming as many wide-ranging problem solving options as we can, we are working to challenge this. We don’t stop at a list of 3 or 4 but instead try keep going until we have around 10 possible options – Remember, at this stage no idea is out of bounds. Solution – Here, the aim is to select one of the generated options and prepare to test it out so see if it will resolve our problem. Again, in the spirit of opening up our thoughts beyond the habitual thinking patterns characteristic of depression, we want to try not to overthink this part. A simple numbering of the options, from 1 to 10, with 1 being the preferred option, 10 being the least, will help in making our choice. A preferred option might be one that is easiest to implement, be easily accessible or just something that we feel might just sort the problem out. It doesn’t matter what criteria you use to decide upon your solution because if it doesn’t work then we are going to go right back to our list and choose the next option. We either solve the problem or find out one more way how not to solve it. Win/Win. The second part of “Solution” is to do a quick plan of the steps we need to implement the solution. Again, we do not need to overthink this – we do not need to come up with another list of problems. Just a quick list of steps of what you would do to get this solution into action. Test – At this stage the chosen option is tested to see if it resolves the defined problem. Just do it. We will look closely at the effects of the solution upon the problem – did it solve it completely or only partially? Did it have no effect at all? Did it make it worse? Whatever the outcome was we can use this information to decide our next steps. If the solution resolved the problem completely – great stuff, relax and reflect upon how well you did. If the solution resolved the problem partially – Either do more of the solution or return to the start of P.O.S.T. and redefine the remaining elements of the problem. If the solution didn’t have any effect on the problem at all – go back to your list of Options and choose the next one on the list. Make sense? Follow the steps below to have a go at practical problem solving yourself. Get the idea? When we are depressed, we can be prone to all sorts of thinking distortions when initially presented with a problem but by clearly defining the facts of the issue, we can make the problem much more manageable. Problem definition: To learn how to soothe the baby. Let the baby cry and hope it grows out of it. Problem definition: How to get more sleep. Now, its time to choose just one of the options from our list. As we don’t yet know which of the options will actually solve our problem, it’s helpful to number each of the items based upon how appealing each may be to test out. Rate the easier to implement, or more obviously suitable, solutions with a lower number and the less immediately appealing solutions with a higher number. We are going to test each out based upon this numbering. 9. Let the baby cry and hope it grows out of it. Don’t become too attached to any potential solution – after testing it out, we may find that it was not the right solution for the problem. So long as we become “unstuck” in our problem solving then we are making progress, and that is a good thing as far as our depression is concerned. At this stage, you will put your first chosen solution into action and evaluate it’s success. When implementing your chosen solution, again try not to get too caught up in overthinking about it. You’ve evaluated it in step 3 so you’ve already decided it’s the preferred solution over the other available ones. If you find yourself stuck, or overthinking too much, then return to your list and choose the next option down. Remember, it’s taking action that moves us forward. If it didn’t solve the problem completely, what effect did it have? Did the problem improve slightly – Do I need to repeat the solution until the problem resolves completely? If the solution had no effect, do I need to choose the next option on the list? Whatever the outcome, try not to evaluate it on an emotional level – this could get us stuck and inactive again. Simply and methodically, return to the P.O.S.T. process and keep going. Define the Problem, generate Options, choose a Solution, and Test it out. Rinse and repeat. I’d be really interested in finding out about how these techniques worked for you. You can give me feedback in the comments section below or get in touch on twitter @newdad_depressn. Speak soon. Disclaimer: Depression in New Dads takes no liability for consequences of using materials on this site. In the event of crisis, a suitably trained mental health practitioner should be consulted.